Often times I am thinking about making a great Mexican style sauce. The taqueria I often visit has a small array of sauces that I am totally addicted to, whether that be dipping chips into or spooning all over my tacos. By default I lean on more spicy sauces, probably more spicy than most can typically handle, and this bombero sauce is right up my alley. This is a great sauce on its own as it is smokey and packs a punch, but when ladled onto a cooked burrito, well it just gets elevated to a whole other level. To a sauce pan, add the arbol chilies, and the water, and bring to a boil. Remove from the heat, cover, and let the chilies steep for about 30 minutes. During this time prepare the rest of the sauce ingredients. After 30 minutes, remove the chilies with a slotted spoon and place them into a blender or food processor. Reserve the chile water. Add the remaining sauce ingredients into the blender or food processor, along with about 1 cup of the chili water, and 2 cups of fresh water and blend until smooth. Pour the mixture through a fine mesh strainer and use a spoon to mash the mixture through the strainer. This will filter any seeds or thicker stuff that you can discard. Now you have your bombero sauce. Taste and season with any additional sauce.Yep, packs a little punch, but don’t worry, my wife and kids loved this sauce and everyone devoured the smothered burritos. Now add that sauce to a sauce pot and bring to a simmer, cooking for about 10-15 minutes. Let cool and store in your refrigerator until you are ready to use. I couldn’t wait. I was the dude sweating in the kitchen, repeating the tortilla chip dunk into the sauce. It’s addicting. Now onto the burrito. Preheat your oven to 400 degrees. Warm a large flour tortilla so it is pliable, then add in shredded chicken, and about 1/2 cup of the quesadilla cheese. Roll and fold the burrito, and place onto a baking sheet and bake for about 10 minutes. The goal is to get a slightly crunchy outside of the burrito. Repeat with as many burritos as you would like to make. During this time, warm up the bombero sauce on the stove, and bring to a low boil. After 10 minutes, remove the burritos, and get ready to sauce them. I ladle sauce over the top of mine, top with more cheese, and place back into the oven until the cheese is melted. I let the wife and kids ladle as much as they want and add cheese if desired. After the cheese has melted, remove and drizzle Mexican crema over the top. 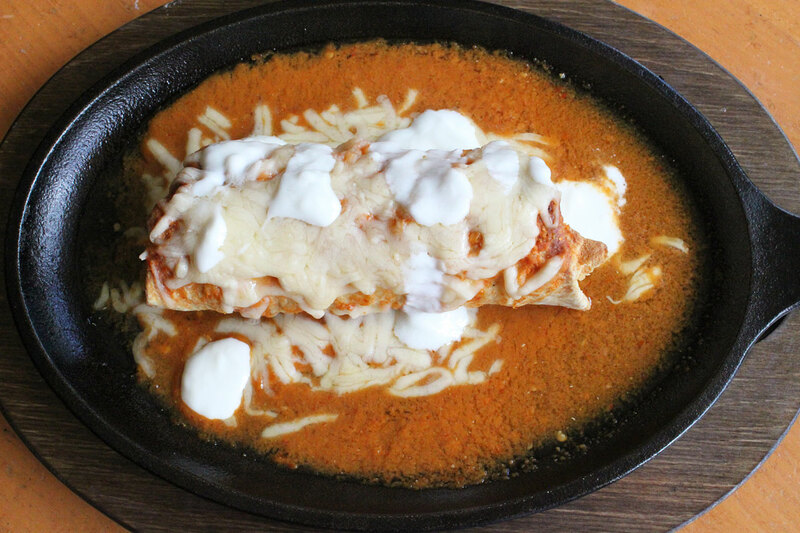 Not only do you get this great, almost baked chimichanga, burrito, but the spiciness balanced with the cheese and crema just made this a meal so liked that I think we all wanted more the following day. It’s that good. Feel free to use that sauce to your liking. Think enchiladas, drizzle over tacos, you name it. It’s a winner. I hope you enjoy!